A combination of two cables make up this USB to Serial RJ45 console cable giving network engineers, technicians, and students a cleaner way of connecting to their data networking consoles. The URJ4856FT USB to Serial RJ45 console cable has an embedded FTDI FT232R and incorporates a ZT213 RS232 level shifter to realize true RS232 levels. It is terminated with a RJ45 connection for direct connection to Cisco and other network equipment serial console ports (DTE). The USB to serial RJ45 console cable is designed for the modern PCs, Laptops which no longer have serial ports. This USB to Serial RJ45 Console Cable combines USB-A to RS232 Adapter and a DB9 to RJ45 cable making a more organized interface. 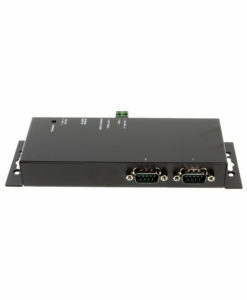 It’s a great space saving alternative for network engineers, students or technicians use on most console ports. The cable provides 1.8 meters to the USB to Serial and the console cable connection length. This length can also be extended using a USB extension cable up to a maximum of 5 meters or even further if using a USB repeater/extending device.